In 1912, two stars were added, representing Arizona and New Mexico, bringing the total number of stars on the U.S. flag to 48. There were thirteen stripes representing the thirteen original colonies. The lower half of the flag is a blue field, the upper half divided into thirteen equal segments, six light yellow and seven red. In the center of the flag is a copper-colored five-point star. The red and the blue are the same shades as the flag of the United States of America, and it measures four feet high and six feet wide. The flag was designed by Charles W. Harris and first sewn by Nan D. Hayden. Blue and yellow are the Arizona colors, and red and yellow the colors of the Spanish Conquistadors headed by Coronado who first came to Arizona in 1540. The copper star represents Arizona as the largest producer of copper in the nation. The flag of Arizona was only adopted after much debate, since some felt that the notion of sun rays from a star was "astronomically improbable." The lower half of the flag a blue field and the upper half divided into thirteen equal segments or rays which shall start at the center on the lower line and continue to the edges of the flag, colored alternately light yellow and red, consisting of six yellow and seven red rays. In the center of the flag, superimposed, there shall be a copper-colored five pointed star, so placed that the upper points shall be one foot from the top of the flag and the lower points one foot from the bottom of the flag. The red and blue shall be the same shade as the colors in the flag of the United States. The flag shall have a four-foot hoist and a six-foot fly, with a two-foot star and the same proportions shall be observed for flags of other sizes. 41-851.C. The flag represents the copper star of Arizona rising from a blue field in the face of a setting sun. A series of new laws have been enacted in Arizona, reports Howard Fisher, Capitol Media Services. All those laws enacted during the recent legislative session take effect Thursday [21 September 2006]. The measure on military flags expands an existing law that says homeowners associations don't have the authority to ban residents from erecting a pole to fly the stars and stripes. The new law adds military flags to the list of what can't be blocked by homeowners association rules. Also included are the state flag, a POW/MIA flag and the flag of any Arizona Indian tribe. Apparently the state flag was not adopted immediately upon achieving statehood, which is common. 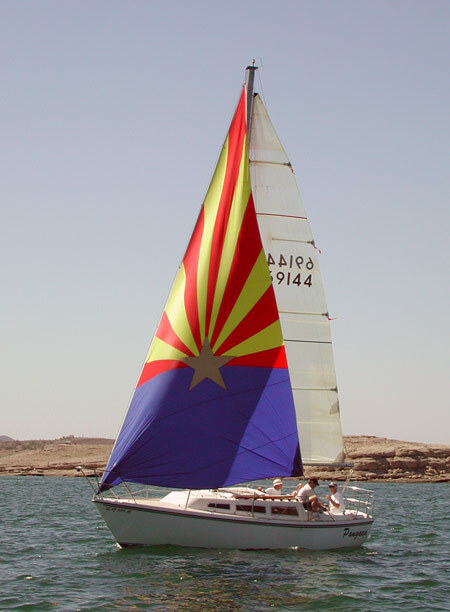 Arizona became a state in 1912 but did not adopt its flag until 1917. The adjutant general of the Arizona territory, Charles Harris, designed the flag in 1911. Arizona was admitted to the Union in 1912. Construction began on the battleship in 1914. The battleship was launched in 1915. The same year, the legislature considered but did not approve Harris's design for the state flag. In 1917, the state legislature adopted Harris's design as the state flag over the governor's veto. Apparently, the USS Arizona's battle flag did not serve as a model for the state flag as such, but the flag that became the state flag was previously used as the battle flag of the ship. It would be very helpful if anyone has documentation on any of this. Originally reported in www.azcentral.com/arizonarepublic/arizonaliving/articles/1112azhistory1112.html (no longer available), the original flag was just for the Arizona Territory's team of sharpshooters to fly as they did not have a flag to fly like the states that already had one. Charles Wilfred Harris was a colonel, Arizona National Guard, and captain of the state's team designed it with Carl Hayden, whose wife, Nan, sewed the first one. The thirteen sunbeams stands for the 13 original states. The state military crest, which is the crest used in the coats of arms of units of the National Guard, as granted by the precursor organizations of what is now the Army Institute of Heraldry. The official Institute of Heraldry blazon is "A giant cactus proper."